Cosmetic dentistry refers to any dental work that improves the appearance even though not necessarily the function of a person’s teeth gums. There are different types of cosmetic dentistry procedures that are used to correct small imperfections or flaws. The popularity of Cosmetic Dentistry has risen considerably in recent years as many people embark on improving their appearance. Before having any cosmetic dentistry carried out it is important that you visit your dentist and discuss with him/her what cosmetic dentistry procedure you are interested in. Teeth whitening is one of the most common cosmetic dentistry procedures carried out in practice today. Teeth whitening can be performed to reduce discoloration and staining or simply to provide whiter teeth. In surgery whitening and laser whitening are some of the popular methods of tooth whitening used today in the UK. There are many teeth whitening medications available including over the counter gels and pastes. 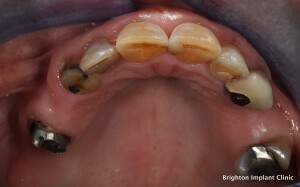 However, this process should be done in consultation with the dentist so as to achieve the best results for your teeth. 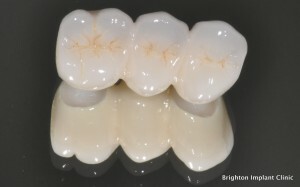 Porcelain metal free crowns and bridges are used when natural teeth need to be crowned or bridged. Newer materials available today contain no metals, hence they are more bio-compatible in your mouth. 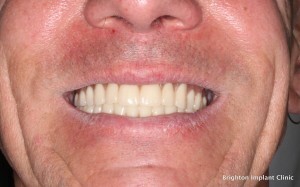 At Brighton Implant Clinic we use the Emax system of higly aesthetic natural looking dental crowns and dental bridges. 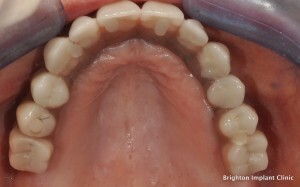 Fixed dental bridge cannot be taken out of your mouth as you might do with removable partial dentures. Porcelain veneers are a very exciting treatment available to us today. If you have problems with broken, worn or discolored teeth then porcelain veneers may be the right solution for you. Unlike full crowns, a porcelain veneers is a very thin shell of porcelain which is made in a dental laboratory. The natural teeth do need to be altered slightly in order for the porcelain veneers to be attached. The porcelain veneers are attached using strong resin based dental adhesives. Dental implants are small artificial titanium screws which can support crowns, bridges or dentures. Dental implants are known to be successful in 95% of cases. Having dental implants is the most conservative option available today for replacing missing teeth. Cosmetic dentistry needs healthy gum tissues. Good oral hygiene and regular visits to your dentist and hygienist are highly recommended. 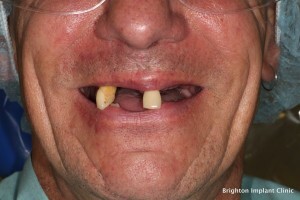 For more information feel free to Contact Brighton Implant Clinic or Call us on 0800 111 6623.